I know some of you are aware of my (strange) obsession with this race/track. 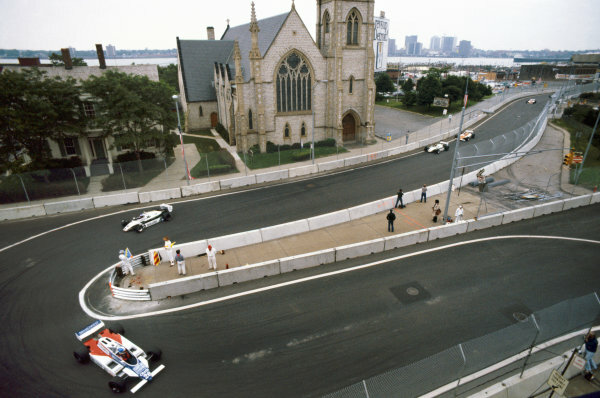 The Grand Prix on the streets of downtown Detroit was run from 1982 until 1988 (largely covering the turbo era). The Renaissance Centre was the central landmark of the track. At the '88 event, it became clear the sole request of F1 could not be met: an improvement of the largely primitive pit stands. Thus the decision was taken to say goodbye to what had become a popular event with the Detroiters over the years. 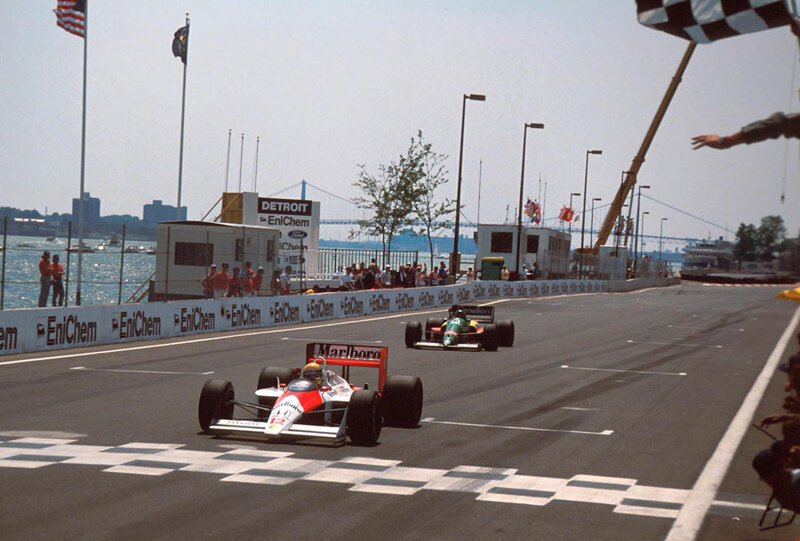 Here Senna, the most succesful driver at Detroit with three (consecutive) wins, is seen winning the Detroit Grand Prix. Although disliked by many*, Martin Brundle enjoyed it and describes it as one of his selected tracks in his book "Working The Wheel". 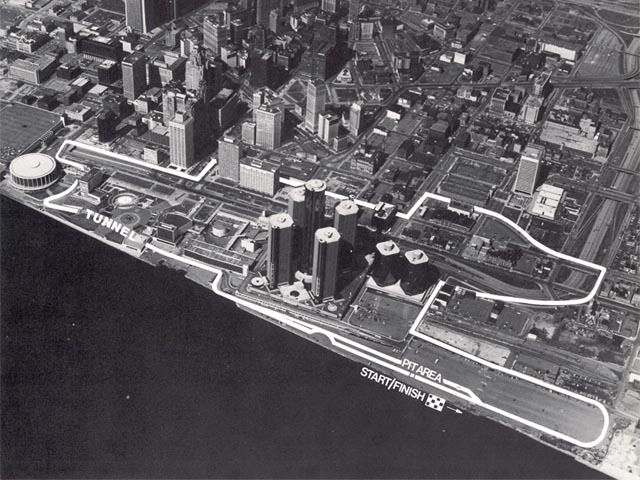 Back in 1985 Coleman Young passed on the chance to make downtown Detroit the permanent home of the US Grand Prix by refusing to sign a 20 year contract with Formula One officials. He didn’t want the land east of the RenCen, where the pits and the grandstands were set up, to not be available for development. Now, more than 20 years later, all that’s been built on that land is a couple of lousy parking structures. What a missed opportunity! The last F1 race back in 1988 was run when I was a few months old - obviously I have no recollection. Could some of you who did watch these events live sum up your feelings at the time? I saw all the GP's i could/wanted since 1981. But have no recollection of this track. I only remember it for John Watsons win from the back of the grid, could also be the place of Tyrrells last win but I'm not certain on that. much like its admirer then. anyway, I have this book "Postcards from Detroit". Will take a look and see what I can share with you. ...see what I can share with you. I think I'll just lock myself up in the Renaissance Centre then, and shut up for the rest of my life. I think I'll just shut up about Kimi, Palmer, Petrov, Russia and Detroit for the rest of my life. On this day in 1982, 36 years ago, sensational F1 history was written and is still felt today. Due to 'operational' reasons (aka the track not being ready), the Friday of the inaugural Detroit weekend was cancelled. This meant two practise-followed-by-qualifying sessions on Saturday: one in the morning, and one in the afternoon. With the afternoon forecast to be wet, the morning times would prove pivotal. Nelson Piquet's Brabham-BMW turbo engine let go in the morning, without having set a competitive laptime. As the afternoon sessions were indeed wet, Piquet could not set a laptime fast enough to qualify. He was sidelined for the rest of the weekend, meaning the reigning champion at the time did not take part in the race. Remarkably, he won the race after in Canada. And two years later, Piquet would not only qualify on pole in Detroit - he would also win the classic GP. Some claim, had Brabham stuck with Ford for the Detroit GP, Nelson would have been champion that year. more importantly perhaps, 36 years ago today, Watson drove a quite perfect race on his way to the win (again from a lonely qualifying position somewhere towards the back of the field). he overtook 3 cars in one lap (although arguably Lauda let him through). Unfortunately I don't have YouTube access here, but perhaps someone can post this 'lap of the gods'? They say he who works hard will get his just reward. Well, that was certainly true of the organisers of the first Detroit Grand Prix, and of McLaren's John Watson, who became Motown's first GP winner. An unnecessary red flag for what was a relatively minor incident stopped the race after six laps, just as it was beginning to get interesting, but after a long delay we did eventually get a race to remember. After three days of agonising labour pains, the Detroit organisers finally gave birth to a healthy race in which Watson stormed through from 17th place to take his second and McLaren's third win of the season with a superb drive that left everyone else in his shadow, including team-mate Niki Lauda, who crashed attempting to emulate Watson's charge. It was very reminiscent of Watson's Belgian GP win; his driving, his car and in particular his Michelin tyres were better on the day. There was the usual Renault on pole position, and it led the race before Alain Prost fell back with a fuel-metering unit problem. Keke Rosberg stepped in to take the lead by a comfortable margin and it looked as though we were finally going to see his first GP win, but once again he was a disappointed man, with Watson the cause of that disappointment. "When Watson began to pressure me, I had to push the car hard. Up until then it had been perfect, but it all began to fall apart. The brakes started to fade, the front tyres lost all their grip and then later in the race I lost third gear," said Rosberg, who eventually finished a distant fourth. It was a fine drive from local hero Eddie Cheever. He breathed new life into the old Ligier JS17 to take second place after a long struggle with Didier Pironi's Ferrari, which came in third. Jacques Laffite was going equally well in the second Ligier, despite losing its nose and twisting up the front wing against the back of Pironi's car as he moved through to take third place, only to lose it again in the closing stages of the race when his Matra motor lost power. He hung on to take the final points with sixth place, a lap behind, while fifth went to Derek Daly's Williams, which was ahead of Rosberg on the road but, with the additions of times from 'heat one' and the main race, dropped a place in the results. At the end of the day, Detroit's first GP had to be a success. A claimed crowd of 100,000 watched the race, the birth of which would have been a lot easier had FISA taken notice of its own rules and made the circuit organise a pre-GP event to iron out the problems. A modest Watson said after the race: "I owe my success to a good car and the right tyres, which were chosen on the advice of Michelin." His first feelings about his six-point world championship lead were: "It puts me in an embarrassing situation with the team." I am sure, however, there are no complaints from McLaren about his win. It was a scramble for all the teams to make it from Monaco to Detroit in a little over a week, one which the Toleman team did not make after its transporter broke down on the way back to England, but the 29 remaining cars were ready and waiting in Detroit on schedule. Unfortunately, their mad dash could have been a little more relaxed, for when they arrived on the banks of the Detroit river, the track wasn't ready and they had to spend plenty of time waiting. There was good sense in the rule that demanded a new circuit should hold some kind of warm-up race before staging a grand prix; especially a street circuit, which is not even open to inspection until race weekend. However, once again it would seem that money talks louder than common sense. The rules were conveniently changed to suit the circumstances and FISA gave Detroit the go-ahead to willing but inexperienced race organisers, who would have been far better off learning the mistakes with some quiet little Formula Atlantic race before exposing themselves to world attention and Formula 1 World Championship racing. The track was still being constructed as Thursday's practice day came and went, while the first track inspection by the drivers revealed a lack of adequate run-off areas and tyre protection that added sill further to the delays as thousands more tyres had to be found, marshals posts relocated and run-off areas improved where there was still possibility. Practice slipped further and further behind schedule and it was not until 4pm on Friday afternoon, following a final track inspection by Lauda and Pironi, that the football and frisbee games in front of the pits came to a halt and the grand prix circus could go back to work. As the first cars echoed around the tall buildings all around the track they added a wild new sound to Motown music. There was a sense of relief, but with the first hurdle down there was plenty more to be overcome before Sunday night. Nobody appeared to have learned the lesson of Long Beach. There were no cranes to hoist away crashed cars and the prospect of crash trucks in even more confined spaces was as daunting as leaving the cars where they lay. The US$800,000 track resurfacing, completed just a couple of weeks before the race, was another unknown factor, which the lack of practice did little to resolve. If the tyres started pulling up the surface, as they have done on so many other freshly-surfaced tracks, the Detroit GP could rapidly turn into a demolition derby. Fears of the track being too bumpy were soon confirmed in the opening laps. The "very smooth" surface boasted by the organisers might have been smooth for a Cadillac at 50mph, but it was a whole lot different for a GP car with almost solid suspension and a top speed of 150mph on parts of the track. Twenty corners, including a couple of very tight hairpins (which were giving several drivers very serious problems getting around without stalling their engines) soon brought the average lap speed down well below 100mph to somewhere around 80mph, making it even slower than Monaco. There were some desperate-looking bumps and even a railway line crossing the circuit at one point, but having said all that it was not as bad as people had thought it might be. "The bumps are bad, hard on the car, for sure, but for the driver they are not as bad as Monaco. There the bumps set up a frequency so that you can hardly see where you are going, but here it's one big bump, and once you ride over it it's not so bad," said Rosberg, while Riccardo Patrese thought much the same and added: "You can drive off line and avoid most of the worst bumps." Once most of the drivers got a few laps behind them they also found it easier to set up a nice rhythm, unlike Monaco, "Where you are always right on the edge and half out of control," added Rosberg. As for downtown Detroit itself and the Renaissance Centre around which the circuit was constructed, it certainly bore very little resemblance to the charm of Monaco we had left behind a fortnight ago. A huge maze of cement and glass housing the entire GP entourage was the subject of as many complaints as the delays as everyone got lost for the first couple of days. Cars decorated the tiered walkways, rock-and-roll from a live bad echoed throughout its cavernous interior and while it might not have been to everyone's taste it was certainly a new experience in American culture. The mechanics found themselves working in an underground car, and while the bare pitlane a few hundred yards away might have been suitable for the sunnier climes of California, in a cool Detroit with rain falling it was not much fun. The rush from the previous race meant that there were very few technical changes to the cars, although Ferrari had managed to fit a new Williams-type front-suspension on one of its cars and there was also rumour of an exceptional water-injection system that was a very closely guarded secret. Certainly one car was carrying a small water container and some system to inject water into the fuel mixture, thus increasing the power just like the water-injection systems used in many jet aircraft. Williams was trying carbon discs on its spare car, while in the next pit Nelson Piquet had a new smaller turbocharger fitted to his BMW engine in a bid to increase throttle response. From Pirelli there was a new tyre construction that Arrows tried and found considerably better, but as there was only one set available and not in the right compound it was something it could not really benefit from in Detroit. With practice reduced to just one hour on Friday and two separate hours on Saturday, it was decided to make Friday's session untimed and both of Saturday's sessions counting for grid placings. There was precious little time for the drivers to learn the track, set-up their cars and sort out gear ratios before battling for grid positions, but their task became even more difficult when rain fell throughout Saturday afternoon. This effectively limited timed practice to just one hour, and total practice to two. "We are under a lot of pressure for the race," remarked Prost, who was doing better than most after setting the fastest time on Saturday morning, which was to ensure him pole position for the race. As in Monaco, the Renault team showed that its latest engine modifications now make it just as competitive on a slow circuit as on a fast one, although its Friday practice did not start out as well as it had hoped. Prost lost a lot of time with an electrical problem on his race car and eventually was forced out in the spare. Meanwhile, Rene Arnoux came back to the pits on foot after clipping a wall with the rear-left suspension, so he was forced to sit out the last 30 minutes. Jan Lammers' luck ran out early when the throttle stuck open on his Theodore. The car understeered off the track and hit the wall, wrenching the steering from his grip with such force that it broke his thumb. He had to have it operated on and pinned, which will certainly put him out for Montreal. His chances of making his home Dutch GP do not look very promising either. The pounding the track was giving the cars was soon confirmed by Jean-Pierre Jarier when he brought his Osella into the pits with a fractured rear-crossbeam and its whole left corner askew. He jumped straight into his T-car only to stop a few laps later when the engine went on that! Bruno Giacomelli demonstrated the inadequacies of the run-off areas when he missed his braking and went up the escape road, only to find that he was stuck there and did not have the room to turn around. Several other drivers also suffered the embarrassing moment of stalling their cars at the hairpin, but otherwise Friday featured no other serious incidents. Saturday dawned cool and grey, and with the threat of rain in the air there was a sense of urgency as everybody, ready or not, struggled to set the best time they could for fear that it might be wet in the final session. Once again the Alfa Romeos proved to be very effective on a slow, tight track and it was Andrea de Cesaris who set the quickest time on Friday. But just as in Monaco it was the Renault that turned up the wick to take pole position just 0.3seconds faster than de Cesaris who, despite his speed, was complaining of power understeer as well as slower traffic every time he went for a quick lap. "I set my best time on tyres which had already done 13 laps. For sure I could have gone as fast as the Renault if I had a clear lap at the beginning" he said. The front row of the grid was still a good effort, but he blotted his copybook in the afternoon when he crashed in the wet entering the tunnel section where the surface was exceptionally greasey. "Perhaps I touched the wall going in, because the car suddenly went the opposite way to the corner and I spun and hit the wall," said de Cesaris, who was flat-out in fourth gear at the time. The car took it well. Bent suspension on the right side was the only serious damage and the team had the car ready to run again for Sundays race. Fortunately it was only his T-car, and he had managed an impressive second quickest before the incident. His team-mate Giacomelli did not run in the wet, his morning time putting him on the outside of the third row. Rosberg was again the quickest Goodyear/Ford combination, feeling that he could have made the front row, but just as he was going for his quick lap on qualifying tyres (after running full tanks and race rubber for the first half of the session), he was flagged to a stop while Watson's damaged McLaren was towed back to the pits after a wheel-banging session with Chico Serra's Fittipaldi. Rosberg's team-mate Daly was disappointed with the handling of his car and could not better 12th, although his disappointment was lessened after practice when the mechanics found a broken rear-shock absorber that had been the cause of all his problems. The outside of the second row went to Pironi's Ferrari, his T-car fitted with the revised front-suspension he preferred and decided to use for the race. The sensation of practice was Manfred Winkelhock in the ATS. The seemingly fearless German threw his car around with great abandon to take fifth, although his team-mate Eliseo Salazar found himself at the back of the grid after a miserable time with his car. "It's not handling right and we cannot find the problem" said Alistair Caldwell. A spin in the morning caused Salazar to lose most of the vital first session, the same thing giving him very little practice on Friday, especially when he rushed back to take over the T-car, only to have that in trouble when the starter bendix jammed. It was an all-Lotus fourth row as Nigel Mansell and Elio de Angelis took the next two places, Lotus running both its cars with no rear bodywork to improve cooling and engine breathing. Both the Lotus drivers found traffic as they went for their quick laps on qualifying tyres. Both reckoned they had a lot more to come, but the rain put a stop to that. Although the Ligier team brought its new JS19 to this race, it was as a spare only and never turned a wheel throughout practice. Instead, it relied on the old JS17s for Laffite and Cheever, which turned out to be a good choice, for Cheever set an impressive ninth fastest whilst Laffite ended up back in 13th place, also held up by the Watson incident and setting his time on his very last flying lap. Lauda shared the fifth row with Cheever, the Austrian just as unhappy with the handling of his McLaren here as he had been in Monaco. "The car is terrible, understeering badly and we cannot do anything about it, but at least I know why," said Lauda, the problem being that the car's aerodynamics were simply not effective enough on such a slow circuit. Lauda was quickest in the wet however, while Watson was fourth fastest, so as far as the McLaren team was concerned a wet race would suit it better than a dry one. Watson's incident with Serra, who did not see him as he went inside the Fittipaldi under braking, cost him much of his valuable hour's practice and although he got out in the T-car in which he set his time, he was unable to make better than 17th time. Ensign resolved its tyre problems with Michelin and it certainly improved its fortunes. From his normal struggle at the back end of the grid, Roberto Guerrero jumped up to 11th on the grid despite understeer problems and having to get used to a whole different driving style with his car on radial tyres. It was a really good effort from the Colombian driver. This race was not a happy one for the Brabham team. 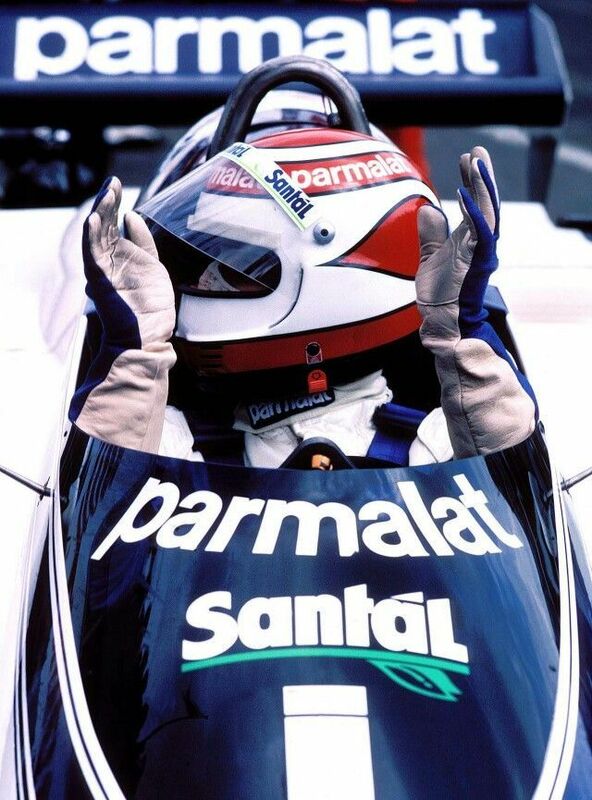 Patrese was unhappy with the handling of his car that he described as "very nervous," and never got a clear lap on qualifying tyres, which left him back in 14th place. 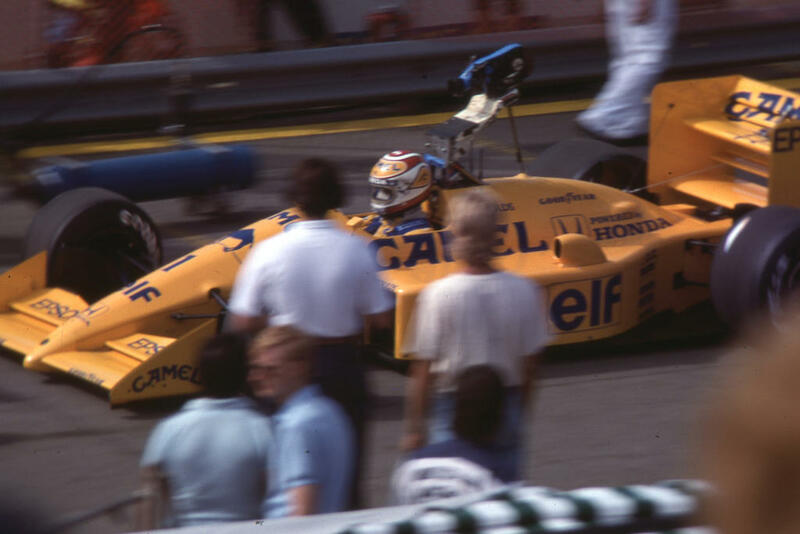 It was a disastrous showing for Nelson Piquet too, as he became the first world champion not to qualify in his world championship year since Jody Scheckter's penultimate race for Ferrari at Montreal in 1980. He did only a few laps in his race car before he stopped out on the track with a broken engine, and then the spare car had electrical problems and would not pick up at low revs, so he ended up slowest on Saturday, the rain preventing him qualifying the Ford-powered car in the final session. Another spin left Arnoux relegated to the eighth row of the grid after a lot of delays getting back to the pits, while Michele Alboreto was disappointed that his promising Friday showing came to nothing when he could not get his qualifying tyres working properly despite plenty of laps. Jochen Mass shared the ninth row with Watson, ahead of Marc Surer's Arrows and Brian Henton's Tyrrell on the 10th row. Raul Boesel headed the 11th row in the second March, which was oversteering badly on qualifying tyres. He had a different rear tyre fitted to his car compared to Mass and thought that might have been the trouble. A frustrated Jarier found himself back on the 11th row, frustrated with his Pirellis, which he reckoned was his biggest problem. "When you look at the sudden difference to Guerrero after his switch to Michelins it makes it even more frustrating," said Jarier, who had his team-mate Riccardo Paletti alongside him, even though he was over 1s slower. Salazar completed the last row with Serra, who was thankful to be in the race with his car, which he complained had no grip at all, understeering and oversteering badly over the bumps, "we think because the skirts are not working properly." Besides Piquet and Lammers, Emilio de Villota was the only other disappointed non-starter, the Spaniard complaining that the back end of his March was steering the front, the team finding that once again the rear wheel bearings had developed a lot of play in the uprights just as they had in Monaco. After all the delays and uncertainty of practice, there was almost a feeling of relief rather than excitement as the cars lined up on the grid ready for the 2:20pm start. A flotilla of little boats, plus a great big old-fashioned steam boat with a banner exclaiming "Dodge salutes the Detroit Grand Prix" down the side had gathered in the choppy waters of the Detroit river beside the start/finish line. Everyone was eagerly awaiting the off. Everyone but the Osella team, that is. Pre-race, Jarier had an oil leak onto the exhaust system, which started a blaze at the back of his car. A fire marshal struggled to get an extinguisher working and in the end it was Jarier who took it and put the fire out himself, by which time enough damage had been done for the team to decide Jarier should use Paletti's car for the race. That was not the end of the team's troubles. As Jarier drove to around to the grid, he stopped out on the circuit with a punctured rear tyre and by the time he got back to the pits to take out the ill-sorted spare tyre he was then too late to join the grid, and had to wait in the pitlane to start the race from the back after the green light. It was a good clean start when the red light turned to green, Motor City music echoing off the Renaissance Centre as Prost and de Cesaris got away almost side-by-side. Rosberg made a brief attempt to squeeze between the Renault and the wall after a great start from the second row. Once the turbo had got itself wound up to full boost, Prost had little trouble outpacing the rest into the first corner, and was soon pulling away from his aggressors. Everybody made it through Turn 1 without incident, but by the time the Renault flashed into sight at the end of the first lap we were already missing Mauro Baldi. He had run his Arrows over the back of Boesel's March at one of the hairpins, putting the Arrows out of the race on the spot with a badly damaged front end. Boesel was able to limp the March back to the pits, where it was retired with broken rear suspension. Alboreto was also in the pits at the end of the first lap after banging wheels with Daly, the Tyrrell needing a new trackrod before he could continue. The surprise of the morning warm-up session had been Winkelhock's ATS heading the timesheets. Winkelhock was all fired up to head the race after the start, but his enthusiasm got the better of him on lap two when he hit the wall, adding yet another car to the fast-growing list of retirements. On lap three, it was de Cesaris's turn when he brushed a wall. This must have loaded up the driveshaft, for at the end of the lap he limped into the pits with one of the Alfa's driveshafts broken, leaving Rosberg a clear road to Prost, who had already pulled out several seconds over the rest. Behind Rosberg, the gap was growing as Pironi, his Ferrari heavy on fuel and light on brakes, set up a comfortable cushion for Rosberg with Mansell, Giacomelli, Cheever, Arnoux, Lauda, Laffite, Guerrero, de Angelis, Mass, Watson and Patrese following on behind. Rosberg soon began to pull back Prost's lead. The race was just beginning to settle down when the red flags come out at the start/finish line on lap seven. There were a few nasty moments as a couple of drivers came roaring through the chicane to see the road blocked ahead of them, but everyone pulled up safely, got out of their cars and started wandering about the grid finding out what had gone wrong. The rest of the field went through under yellow flags without any problem, but by that time somebody had ordered the red flag. It was an overreaction to the situation, and the Detroit Grand Prix came to an embarrassing stop barely 10 minutes after it had started. Having done that, there was then a ridiculous delay of just over an hour while teams added fuel, changed tyres, skirts and anything else that didn't look right. The drivers were strolling around the grid, taking a drink and trying to take the whole affair seriously, although it was fast becoming a farce. "We wanted to have a pace car, but they wouldn't listen. Now I get to stop every 10 minutes for a drink. Great way to go racing!" said Lauda. Rosberg stood around and watched the Renault team change tyres and a skirt on Prost's car, effectively putting him back in the race. "I was three seconds behind him when the flag came out and I would have got him for sure in the next five laps. His tyres were graining badly," complained Rosberg, who now had to steal himself up to do it all again. "I'm not sure that grand prix drivers are built to make three or four starts in a day," he said. This was the prospect they were all facing if the red flag was going to be hung out every time there was a minor shunt. Finally, a new grid was drawn up in the lap six finishing order, and the 20 cars still left in the race were pushed back onto the grid for a second attempt at running a world championship event. Jarier did not go to the grid, for the luckless Frenchman had already pulled out before the crash with electrical problems. The times from the first part would be added to the new one at the end of the race, so with a 3s advantage, Prost repeated his first start to lead Rosberg, Pironi, Giacomelli, Cheever and Arnoux into the first turn. This time, Prost was able to leave Rosberg behind in the opening laps, while a great battle for third place developed as Giacomelli and Cheever pushed Pironi through the turns, working away at the Ferrari's brakes; the reason why Pironi could not make a clean break. Arnoux was soon in trouble, his engine misfiring at the top end. It did not take Lauda long to find a way ahead. Mansell was in trouble with the handling of his Lotus and soon slipped back behind Daly, Laffite and Mass, ending up dicing with his own team-mate until de Angelis went missing with a broken gearbox on lap 18. Also gone from the back of the field after 14 laps was Salazar's ATS, while Henton went to the pits to replace a loose rear wing which had nearly caused him to spin off a couple of laps before. 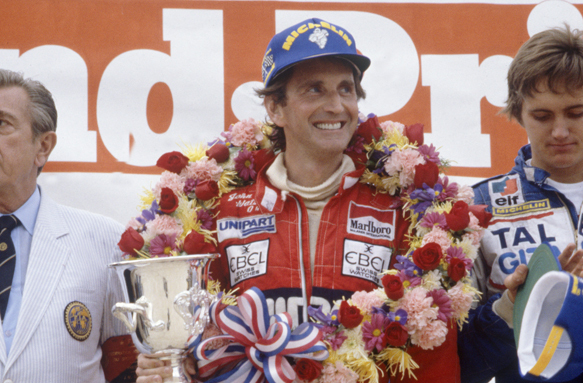 As the race moved towards its 20th lap, Prost's lead suddenly began to shrink considerably. He too was suffering the same fuel-metering troubles as Arnoux, and by lap 23 Rosberg had closed the gap and taken the lead around the outside of one of the hairpins without any fight from Prost. Pironi, Giacomelli and Cheever were still tied together through the turns, while Lauda was closing up on trio, leaving Daly struggling with Laffite who had made short work of Arnoux's sick Renault. All eyes were now on Watson. From 13th place at the restart, he took both Lotuses on Lap 16, Mass a lap later, then Arnoux a lap after that. Laffite was in sight now and he was closing that gap very fast, taking eighth place from the Ligier on lap 24. A lap later and he took seventh from Daly. Just before what turned out to be half-distance, for this race would never make the 75 proposed laps before the two-hour limit was reached (at something a little over 60 laps at the speeds they were doing), Watson moved into the points as he passed Prost, by this time falling away fast before going into the pits for a long stop on lap 30. "I have never been very good in practice, but always a strong racer," Watson has stated on many occasions, but this time he was really proving his point. On lap 33, the now revved-up 'Wattie' counted off the positions numbers on his pitboard, delivering the coup de grace passing Lauda, Cheever and Pironi all on the same lap! Giacomelli had dropped to the back of this group when he got sideways out of the first turn and nearly spun, and then when he was passed by Watson as well he got fired up to try and retake the McLaren on the next lap. Watson went a little wide and Giacomelli went for the gap that was already closing. He was committed by this stage, and the front wheel of the Alfa ran over Watson's rear wheel. The Alfa bounced out of the race, while Watson carried on unabated. A desperate Rosberg tried to pour on the coals in his Williams, but his 12s lead dwindled to just 3s in four laps, and on lap 37 the McLaren shot by into the lead. This spurred Lauda into action. He took Cheever on lap 35 and Pironi next time around, and by lap 40 he was also ready to go for Rosberg, who was still technically leading the race with his first part advantage over Watson. Lauda came up behind Rosberg at the end of the pit straight and tried to dive inside the Williams, which was already moving across into the first turn. Rosberg saw him coming and expected him to back off, but the McLaren kept coming and tried to squeeze between Rosberg and the wall. He bounced off the Williams and the wall and came to a stop just around the corner with bent front suspension, out of the race. "It was a silly mistake. When I saw John coming through the field like a rocket I wasn't using my head. I was still in second place at that time. I should have known what was going to happen and waited a little longer to take Rosberg," admitted the Austrian, who had thrown away a certain six points and maybe even a win, for the lap before his crash he had broken 1m52s for the first time, although Watson had put together a string of 1m51s. 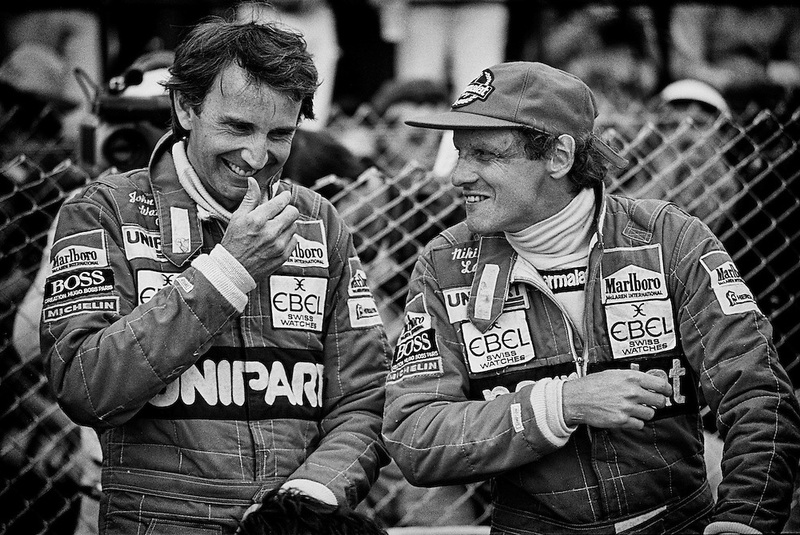 From then on, Watson was able to cruise home to victory, knocking almost 2s off his lap times and still staying comfortably ahead of Cheever, who had little trouble taking Pironi and then Rosberg after Watson and Lauda had shown him how it was done. "I couldn't get near Pironi under acceleration with all the extra weight of my car, but although my rear brakes were not so good they were better than his and I was able to close up on braking. In the end I half shut my eyes and went for the gap. I knew if Pironi had shut the door we would have both gone off," said Cheever, who ended up almost 16s behind Watson at the flag to score his best grand prix result to date. Laffite came through the field, bending the front wing of his car against the back of the Ferrari as he took fourth place, then he moved up to third place behind Cheever after taking Rosberg. But the charge was short-lived. After four laps in third place, Pironi retook the Ligier again, Laffite's engine losing power. "If I had not been in the points I would have stopped," said Laffite later, but he hung on and slid back down the leaders board again, being lapped by Watson a few laps from the finish. Rosberg was struggling with no third gear, while in the closing laps the fuel pressure also started to drop. Daly soon caught him to take fourth place, but despite pulling out a big gap in the last few laps it was not enough to overcome his first part deficit to Rosberg, who managed to keep fourth place in the end. Mass and Surer finished seventh and eighth behind Laffite. Also a lap down, Mass's race was spoiled by a broken exhaust pipe for half the race. Henton came next, a further lap down after his earlier stop, while both Renaults finished at the back end of the field in strong form, but too far back after their pit stops to hope for points. 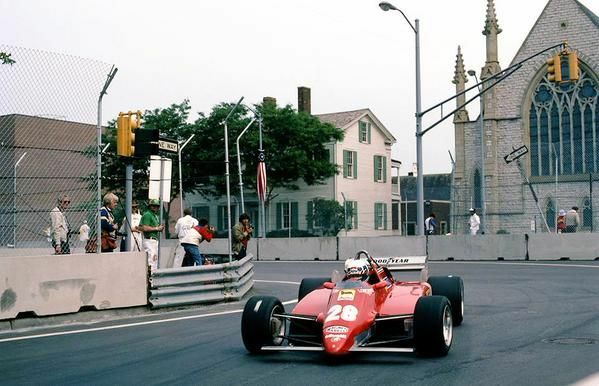 Arnoux, three laps down, took tenth place ahead of Serra, while Prost was eight laps back, but did at least have the consolation of setting Detroit's first lap record at a staggering 81.276mph on this tight circuit. There was a big sigh of relief when it was all over, but everybody seemed to have a nice day, which is what really counts in the US of A, right?